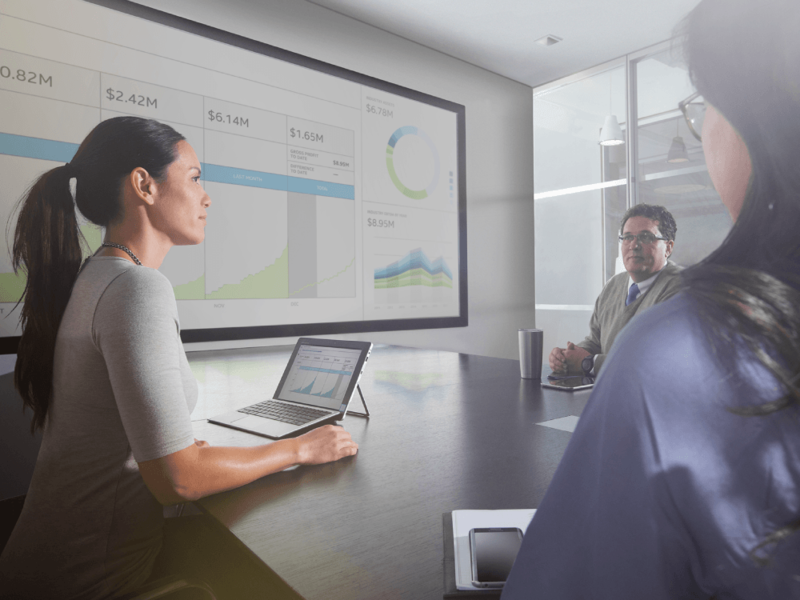 As Intel IT’s Real-Time Collaboration Program Manager, I’ve had the opportunity to see the amazing transformation the Intel Unite® solution has wrought in Intel’s collaboration spaces. 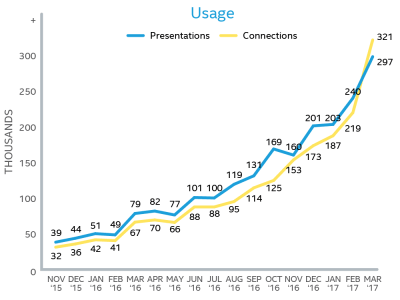 Over the last 18 months, I’ve watched as we have gone from manually hooking up a laptop to the room’s display device, wrestling with adapters and dongles, and struggling to share content from outside the room, to collaboration nirvana – the ability to quickly and wirelessly share content from anywhere. We estimate that by the time we are finished deploying the solution to a total of 4,000 conference rooms in a few months, the solution will be saving Intel about 180,000 productivity hours annually. Going forward, the Intel Unite solution will be a standard part of any new or renovated Intel facility. Telemetry plug-in. We used the Intel Unite® Plugin Software Development Kit (Plugin SDK) to develop a telemetry plug-in that provides visibility into how employees are using the Intel Unite solution. The plug-in gathers information about the number of connections, the length of each connection, and the number of presentations, which we can then extrapolate into usage data – that is how we derived the hours-saved figure mentioned earlier. We can use monthly and yearly charts (see illustration below) to show management that the Intel Unite solution is a very likeable product and that people are using it with no training or help from IT. In fact, I can safely say that Intel IT has never before provided a solution that is so clearly useful and popular. Real-time monitoring agent. In each conference room equipped with the Intel Unite solution there is a Mini PC that hosts the Intel Unite® We call these Mini PCs “hubs.” We developed a software agent, installed on each hub, that sends a periodic “heartbeat” to a central server that monitors for them. If a hub fails to report a heartbeat, the interface on the monitoring server automatically creates an alert to IT support staff, who can then use Intel® Active Management Technology (Intel® AMT) to remotely access the hub and perform some actions, including power control. Asset management database. During our audit of conference rooms, we had to physically “touch” each room in which we deployed the Intel Unite solution – the perfect opportunity to gain a thorough understanding of exactly what sorts of rooms existed and what type of equipment was in each room. We used an existing asset management database, created for earlier real-time collaboration projects, to store room and equipment information, such as room type (small or large), room location, display equipment type, electrical capabilities, and more. Now that we have deployed the Intel Unite solution to more than 3,500 rooms worldwide, we have a very comprehensive picture of the “contents” of each conference room or other collaboration space across all Intel sites. We can run analytics using this database and other Intel Unite solution data to obtain a better usage picture and plan for further deployment. 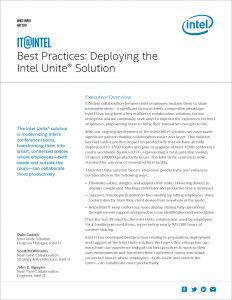 These three tools work together to maximize the benefits of Intel Unite solution deployment. For example, combining the asset management data and usage agent data helps us to develop future deployment roadmaps. Collaboration needs at various Intel sites can vary, due to cultural preferences. We can drill down into the usage data by region, and have discovered that sites in India tend to make much more use of large conference rooms; European sites tend to favor small rooms. Based on this data, we can plan how we might best deploy additional instances of the Intel Unite solution to gain the highest productivity boost. The combination of the asset management database and real-time monitoring agent enables support staff to resolve many issues remotely because they know exactly what equipment is in the room. In our experience, about 80 percent of issues encountered by hubs in rooms are detected and resolved proactively, without end-user action. If a physical action is required (such as reconnecting a power cable) the local support team automatically receives the room location and other details of the hub, enabling quick resolution. Dalit joined Intel in 1996 and was part of Intel’s factory automation journey, working in several managerial roles. 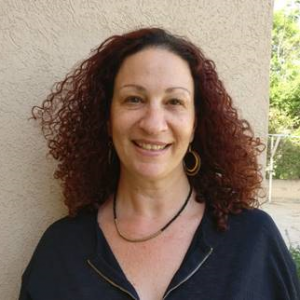 Following that, she spent several years working on Intel’s flash memory products at Numonyx and Micron, eventually rejoining Intel’s manufacturing organization in 2012 as the remote operation center group leader. Currently, Dalit is the Intel Unite Solution Program Manager, deploying the solution throughout Intel’s sites worldwide. Dalit resides in Israel and holds a Bachelor’s of Science degree in industrial engineering and information systems from Ben-Gurion University. She is a proud mother of three girls and is happily married to her husband David. She likes to cook and enjoys good wine and aerobics or any kind of sports training.